Earlier today I was privileged to take the oath of office to become the 24th secretary of defense. I am humbled by and grateful for the opportunity that President Obama and the Congress have given me to once again serve our nation. I am most especially grateful for the opportunity to work with all of you. Every day you work to defend America. The noble cause of your profession, your individual sacrifices, and your service inspire us all. As your leader, I will always do my best for our country and for all of you and your families. 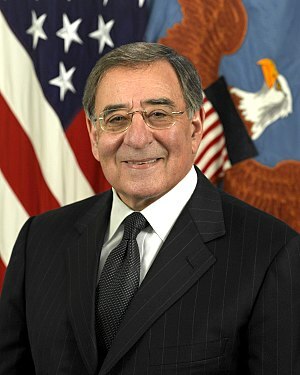 As with my friends and predecessors Leon Panetta and Bob Gates, your safety, success, and welfare will always be at the forefront of my decisions. I will build on the strong foundation of teamwork built by Secretaries Gates and Panetta, as we work together. Leadership is a team business. I have long believed that America must maintain the strongest military on earth; we must lead the international community, with a steady and sure hand to confront threats and challenges together as we work closely with our allies and partners to advance our common interests and build a more hopeful world. We must use all tools of American power to protect our citizens and our interests; and America must engage not retreat in the world, but engage wisely. This is a defining time for the United States military and for our nation. We are emerging from more than a decade of war, yet the threats facing us are no less dangerous or complicated. Despite these challenges, I believe an historic opportunity exists to help build a safer, more prosperous, and more secure world. But to achieve this goal we must ensure that we are ready, trained and equipped to fulfill our role of protecting the country and standing firm against aggression. To that end, the strength, well-being and readiness of our all-volunteer force will be my top priority. This will require 21st century agility and flexibility. We must take care of our people, and working with the VA and other institutions, I will ensure that you and your families get the health care, job opportunities, benefits, and education you have all earned and deserve. My life and career have been about helping our service members, veterans and their families. One of my proudest accomplishments in the U.S. Senate was coauthoring with my fellow Vietnam veteran and friend, Jim Webb, the Post-9/11 G.I. Bill. As I assume this office, I am mindful of the sacrifices that you and your families have made for more than a decade, and continue to make every day. In Afghanistan, where 66,000 of our troops remain in a tough fight, we have a clear and achievable objective to fully transition security responsibility to the Afghan National Security Forces by the end of 2014. As you know, Afghan forces will step into the lead for security operations across the country this spring, and over the next year another 34,000 of our troops will come home. As we turn the page on more than a decade of grinding conflict, we must broaden our attention to future threats and challenges. That means continuing to increase our focus on the Asia-Pacific region, reinvigorating historic alliances like NATO, and making new investments in critical capabilities like cyber. In order to accomplish our mission, we also must make wise budget decisions prioritizing our interests and requirements. Like each of you, I am greatly concerned about the impact that the looming round of automatic budget cuts will have on you and your families, and on military readiness. As someone who has run businesses, I know that severe budget uncertainty limits our ability and flexibility to manage and plan and use taxpayer dollars in the most efficient manner possible. I will work within the administration and with Congress to help resolve this uncertainty in a way that does not break America’s commitment to you, your families, and our veterans. As I begin my time here at the department I want you to know that I recognize the immense responsibility that I have, and will work hard every day to fulfill my duties as secretary of defense as honestly and effectively as I know how. You are the greatest force for good in the world. It is the highest honor to serve alongside you. I am proud to be part of your team. Thank you for your commitment and dedication to our country. I am honored to be introduced by anyone today but I’m particularly honored to be introduced by Sergeant First Class Wirth. He’s a typical Nebraskan: good looking, smart, great patriot, many other virtues. My warmest regards to Shannon and your mother in Vermillion, South Dakota. She deserves all of the credit for producing a family like yours: patriots, people who give to their country selflessly. Everyone in this audience and people around the world are doing that, have done that, and will continue to do that. Gordon, Nebraska, is where Sergeant First Class Wirth is from. It’s a little town up in the northwestern part of the state. My family and I lived in that county, Sheridan County, for five years. My brother, Tom, and I, who were in Vietnam together, served side-by-side; actually, for 10 months of our 12-month tours, we had our tonsils out together back in the ’50s, when dinosaurs roamed the Earth. And I don’t know if it was a two-for-one deal, but it was the only hospital in three counties, Gordon, Nebraska. So I wouldn’t say I have fond memories of Gordon, but nonetheless, thank you. And thank you all for what you are doing and have done, will continue to do for our country. And I also want to address, of course, the people all over the world who continue to help make our country safe, keep it strong, and make America the great nation and the tremendous force for good that America is. I want to also acknowledge much of our leadership in this institution who are here today. Specifically, we have the Deputy Secretary of Defense Ash Carter, who was here, chairman of the Joint Chiefs. We’ve got the chief of staff of the Army. He makes me shake a little, being an old Army sergeant. But the sergeant major of the Army scares the hell out of me, but I think he does the general, too, actually. And all of you who are so important to our country, thank you. A couple of hours ago, I took the oath of office to become the 24th secretary of defense. It’s a great honor. It’s a privilege. Yes, for me, my family, but to be part of your team, who you are is the honor. That’s the great privilege. You’re not joining my team; I’m joining your team. And I want you to know how proud I am of the opportunity the president of the United States has given me and the Congress of the United States has given me. And I will tell you what I told the president, as I told the Congress, that I will do everything in my power to be the kind of leader that you expect and you deserve, also, the kind of leader the country expects and deserves. We are living in a very defining time in the world. You all know that. It’s a difficult time. It’s a time of tremendous challenge. But there are opportunities. And I think it’s important that we all stay focused, obviously, on our jobs, on our responsibilities, which are immense, but not lose sight of the possibilities for a better world. If there’s one thing America has stood for more than any one thing, is that we are a force for good. We make mistakes. We’ve made mistakes. We’ll continue to make mistakes. But we are a force for good. And we should never, ever forget that, and we should always keep that out in front as much as any one thing that drives us every day. As difficult as our jobs are with the budget and sequestration — I don’t need to dwell on all the good news there — that’s a reality. We need to figure this out. You are doing that. You have been doing that. We need to deal with this reality. We’ve got ahead of us a lot of challenges. They are going to define much of who we are, not this institution only, but our country, what kind of a world our children are going to inherit. I mean, that’s the big challenge that we have. That’s the bigger picture of the objective for all of us. Yes, it’s difficult. But it’s also pretty special. I mean, when you think about generations and how many generations have had an opportunity to be part of something great, as difficult as this is, with everything, challenges coming at us, different kinds of challenges, cyber issues, you know all of them. But we can really do something pretty special for our country. I’ve said to the Congress, the president, as secretary of defense, I will do everything I can to ensure the safety, the well-being, and the future of you and your families. And I want to mention for a moment families. I think the families are always in a difficult spot, maybe the most difficult spot, because they are left behind. They’re dealing with a lot of uncontrollables. And we are doing our job, and that consumes us, and that’s good. But the families have a tough time. And it’s also important for you to know that I’m committed to — and I’ve told the president this, the Congress — to assuring that every person in the Department of Defense, associated with the Department of Defense, civilian or military, is absolutely treated fairly, honestly, equal benefits, everything that each of you do should be dealt with on a fair and equal basis, no discrimination anywhere in any way. I’ve always believed that America’s role in the world is one that — and we’ve had variations of this throughout history — has been one that should engage the world. We can’t dictate to the world, but we must engage in the world. We must lead with our allies. Allies are — as everyone in this room knows — particularly important. No nation — as great as America is — can do any of this alone. And we need to continue to build on the strong relationships that we have built. I think what my friends and my predecessors, Bob Gates, Leon Panetta, have done, build on that foundation, not just within our institutions here about teamwork, which I have noted, but teamwork with allies. We renew old alliances. We reach out and find new alliances based on the common interests of people. There will be differences. And we have great power, and how we apply our power is particularly important. That engagement in the world should be done wisely. And the resources that we employ on behalf of our country and our allies should always be applied wisely. The world looks to America for leadership. You know, it’s interesting, when you look at the turbulent times that we are going through in this country, the one institution that still maintains astounding credibility and confidence and trust in this country is this institution, the military and all those associated with it. Gallup runs polls every year, and they take the 15 largest institutions in America. The military’s way up here. Well, there’s a reason for that. The reason is, essentially, what you have done. You earn confidence. You earn trust. It isn’t given away, nor should it ever be given away. You’ve done that through your sacrifices. And we don’t want to squander that. And we can use that to rebuild all the necessary institutions we have to deal with here in our country and the world. The world can look to this institution as an institution they can have confidence in and trust. I will do everything within my power to continue to build on to what Secretaries Panetta and Gates have begun to build and what you all are beginning to build. As I said earlier in another meeting, leadership is a team business. It isn’t about the leaders. It’s about the team. It is about the team. Everybody plays a role in that. This morning, after I was sworn in, I went over and spent a little time at the 9/11 Memorial in the park, the chapel, and reflected a bit on what happened on that day in 2001. I was on Capitol Hill at the time. Everyone in this room remembers where you were at 9:37 in the morning on September 11, 2001. And I surely remember exactly where I was. But in Churchill’s words long ago, that was a “jarring gong,” the event, that set in motion dynamics that we are living with today. You go back almost 22 years ago — as Chairman Dempsey noted this morning in a meeting, 22 years ago tomorrow, in 1991, February 28, the end of Desert Storm. If you take those two events and start charting this, not unlike history, you start to see a picture emerge of different kinds of threats, new threats, and there will be more new threats. And it gives you some dimension when you back up a little bit and understand this, not that any of us, I don’t think, are smart enough to know it all or figure it all out, but it gives us some dimension of what’s going on in the world. The world is at such an uncertain time. Our budget problems here, meaning — if nothing else, what we’re dealing with, what you’re dealing with, what we’re all dealing with is, yes, dollars coming down, but it’s the uncertainty of the planning, it’s the uncertainty of the commitments, the uncertainty of what’s ahead. People are always the most important resource of any institution. You all know that. You always take care of your people, always take care of your people first. And you all have done a tremendous job of that, partly one of the reasons why this institution is so highly valued, trusted by the American people, because you take care of your people. And, again, I say to you, I will do everything within my power as secretary of defense to be worthy of you and to be worthy of this country and to do everything I can to make sure our people are taken care of, their families, our veterans. One of the proudest times in my 12 years in the United States Senate is when friend, former Vietnam veteran Jim Webb, who’s spent a little time in this building over the years, he and I co-authored the Post-9/11 G.I. Bill. I was very proud of that, having nothing to do with me. I was proud of that because we were able to get two World War II veterans, John Warner and Frank Lautenberg, Democrat, Republican, Jim Webb, Chuck Hagel, two Vietnam veterans, Democrat, Republican, we got together, and we got the votes, and we passed the bill. Now, that’s the way things should work for our country, because the objective was not to give Jim Webb or Chuck Hagel or anybody any credit or a party, but the objective was to do something for the country, to do something for the people who sacrifice and who serve and who deserve this kind of attention and this kind of recognition. And I say that because much of my life has been about doing everything I could in some way to help veterans and their families, whether it was chairing the Agent Orange payment program, whatever it was, and I’m proud of that. I’m more proud of that than any businesses or anything else I’ve been involved in. And I’m proud of my background. I’m proud of my career, like you all are. But nothing makes me prouder, has ever made me prouder than my association with the military and the veterans. Well, again, to you, each of you in this room, those of you who are watching this around the world, I say to you: Thank you. Again, I say thank you to you for your service, your sacrifices, and I will do everything I can to be worthy of Sergeant First Class Wirth and his family and everybody in this building. I look forward to working with you. You’ll always know that you have a secretary of defense that will deal straight with you, I’ll be honest, I’ll be direct, I’ll expect the same from you. I’ll never ask anyone to do anything I wouldn’t do. I’ll never ask anybody to do more than I would do. That’s the story of your lives. I wouldn’t be worthy if that was not the case. Again, thank you for this tremendous opportunity. I am very proud to be on your team. Now I’ve got to go to work. 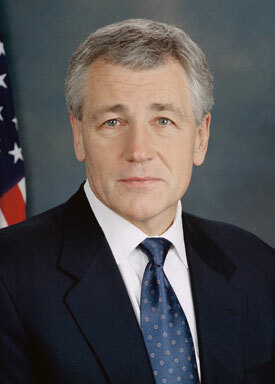 We write to urge you to oppose Chuck Hagel’s nomination to become the next Secretary of Defense. The evidence that has accumulated in recent weeks makes one thing clear: Notwithstanding assurances he has made privately to your colleague, Sen. Chuck Schumer, in the course of his confirmation hearing and in other settings, Sen. Hagel’s longstanding hostility towards Jews and Israel is reprehensible and should disqualify him from this sensitive post. That is especially true at the present moment. As you are well aware, the next few years may be among the most turbulent in the history of U.S.-Israeli relations. This is the case thanks to the developing perfect storm of: continuing and intensifying violence perpetrated by al Qaeda and other jihadists throughout the Middle East and adjacent regions; the ascendancy there and elsewhere of a Muslim Brotherhood equally committed to Israel’s destruction; and an Iranian regime that explicitly and repeatedly declares its intention to wipe Israel off the map nearing the realization of its nuclear weapon ambitions. · Sen. Hagel’s long-held notions about the “Jewish lobby” intimidating Senators. · His moral equivalence between Israel and those bent on its destruction. · His view that Israel’s putative nuclear arsenal is more worrying than an Iranian one. · His co-authorship of a report that recommends inserting U.S. forces on the West Bank to facilitate the establishment of a Palestinian state there. Such a step would inevitably embroil us in that conflict – probably, in due course, with the effect of protecting Palestinian terrorists against Israeli defensive measures. All these bespeak a deep-seated animus that will surely dangerously influence Senator Hagel’s conduct should he become Defense Secretary. No true friend of the Jewish people and Israel can support that outcome. We call upon you to preclude it from happening.